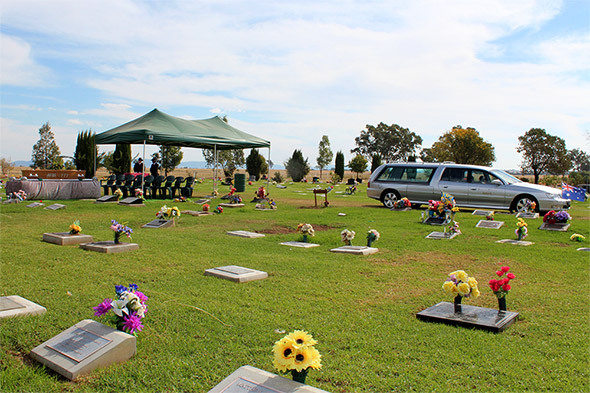 The staff at Bevan Douglas Funerals and Guiding Lady Funerals are caring professionals who assist you in the arranging of the funeral of your loved one who has passed. On receipt of your phone call, brief particulars will be obtained and arrangements will be made to meet with the nominated representatives of the family, either in the comfort of your own home or at our office located at the Lincoln Grove Memorial Gardens, Gunnedah Road, Tamworth. These arrangements are usually done by either the Executor or Next of Kin, but can be done by a nominated representative. We arrange the transfer of your loved one from their place of death into our care where they receive the dignity and respect they deserve. The same Care will be shown to you the family in the arranging process with our Arranging Officer who will explain the options available and assist you to make the decisions. The death of a loved one is a very stressful time, so take a minute to arrange family or friends to sit with you through the arrangement. Your loved ones, or the families wishes regarding the type of service will be required. Whether a burial or a cremation, a graveside service, a chapel service or a church service. Whether a clergy or a celebrant is to take the service. All these items will be discussed by our Professional Arranging officer at the time of the arrangement.